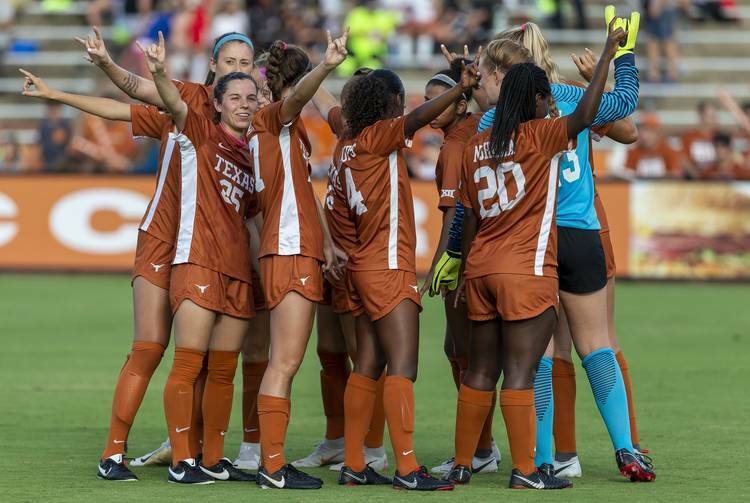 The Texas soccer team converted on a penalty kick in the first half and a late goal to defeat Kansas 2-0 Friday night at Myers Stadium. The No. 17 Longhorns moved to 12-2-2 and 4-2-1 in the Big 12 with the win. The Jayhawks fell to 10-4-2 and 4-3-0 in conference. Despite Kansas outshooting Texas 12-9, the Longhorns cashed in on more of their chances. Texas almost fell behind early, but a penalty kick by Ceri Holland hit off the crossbar and kept the game scoreless in the third minute. The Longhorns earned a penalty kick 22 minutes later and Kayra Dollas converted on the shot to make it 1-0. Neither team scored until Texas put the game out of reach in the 86th minute. Haley Berg took a great centering pass from reigning Big 12 offensive player of the week Alexa Adams and scored. Texas has two remaining Big 12 matches before the Big 12 Championship tournament begins on Oct. 28. The Longhorns face Kansas State Sunday at 1 p.m. at Myers Stadium.